It’s hard to believe that it’s only been 3 years since this picture was taken in Zion National Park. I was wet, cold, and miserable for most of the day. The cold was due to being wet and insufficiently insulated; the wet was due, in equal parts, to having a crappy rain jacket and not understanding its limitations. While I have no way to quantify it, I would venture to say that more articles have been written about, more hours have been spent on marketing for, and more Internet arguments have erupted over, rain gear than any other type of equipment or clothing. I think a poor understanding of the technology and unreasonable expectations have left a lot of people confused and disappointed, and the miracle-like properties that are bestowed upon these products by marketing departments certainly does not help the situation. At the heart of the issue is the term “waterproof/breathable”. It implies that moisture (in the form of precipitation) will not be able to penetrate the exterior, while moisture (in the form of sweat) will be able to escape the interior. This leads to the expectation that you will stay dry while hiking in a rainstorm. The reality is that there are so many variables involved in the performance of these products that it’s unlikely you will stay completely dry. Best case scenario: you’re a little damp but not cold, and you’re a position to dry out quickly once the rain stops. I think this scenario should be the goal when planning for inclement weather. There are tons of sites out there that go into the science of waterproof/breathable fabrics, theories of operation, lab results, and diagrams depicting multiple layers with arrows drawn everywhere to represent water and sweat. Trying to sort through all of it can be overwhelming, especially when so much time is spent on the mechanics of breathable fabric and not enough time is spent on the actual experience of wearing it. If you’re new to the world of waterproof/breathable fabrics (or you need a refresher), REI has an in-depth explanation of the different types of fabric and how everything is “supposed” to work. As usual, Andrew Skurka has a good writeup with a more practical explanation of everything. Both articles cover the purpose, advantages, and problems with these fabrics at a level that is fairly agnostic to specific jackets or brands. While I’m not going to rehash all of that here (the purpose of this article is to give you a practical guide for walking into a store and looking at a jacket), I would like to cover the basic anatomy of a rain jacket so you understand the waterproof/breathable components at a high level. The first thing to understand about waterproof/breathable fabric is that the the outside of the jacket is not waterproof. Repeat after me: the outside of the jacket is not waterproof. Sound backwards? This is where the “magic” of breathability comes in. The material that is required for something to be a barrier to moisture on one side and a conduit for it on the other is incredibly thin and delicate. For this reason, the waterproof/breathable part of the jacket is actually on the inside. The purpose of the outer fabric is to protect the waterproof/breathable part. If the outside of the jacket was waterproof, it wouldn’t be breathable. This is an incredibly important concept to grasp because it will help you understand some of the inherent problems with this design. If you break the layers of a jacket down into functional components, there are four that come to mind. I just covered the first 2: the fabric on the outside and the waterproof/breathable membrane on the inside. Next, we have the component that determines whether the jacket is considered a 2, 2.5, or 3 layer design. In a 2-layer design, there is no 3rd component; the 2 layers are the shell and the membrane. Since the membrane is sensitive to oil, dirt, and abrasion, there is often an attempt to mitigate these issues by adding another layer. This is where the 2.5 and 3-layer designs come in. A 3-layer design consists of an extra layer on the inside of the jacket that sandwiches the membrane between it and the outside of the jacket. The membrane is not visible in a 3-layer jacket. In a 2.5 layer jacket, the membrane is visible on the inside but it is modified slightly to protect it from the aforementioned problems. One approach is to have some sort of “raised” pattern that’s meant to create a small amount of separation between you and the membrane, although I question the actual effectiveness of this. The pattern may offer a small amount of protection from abrasion but the membrane is still mostly exposed. The “.5” seems to be less a physical feature and more of a marketing one in this case. For all intents and purposes, this is a 2-layer jacket. The other common method for creating a “half layer” is to suspend mesh loosely on the inside of the jacket. You can still see the membrane through the mesh but unlike the first method, there is a separate physical layer present. 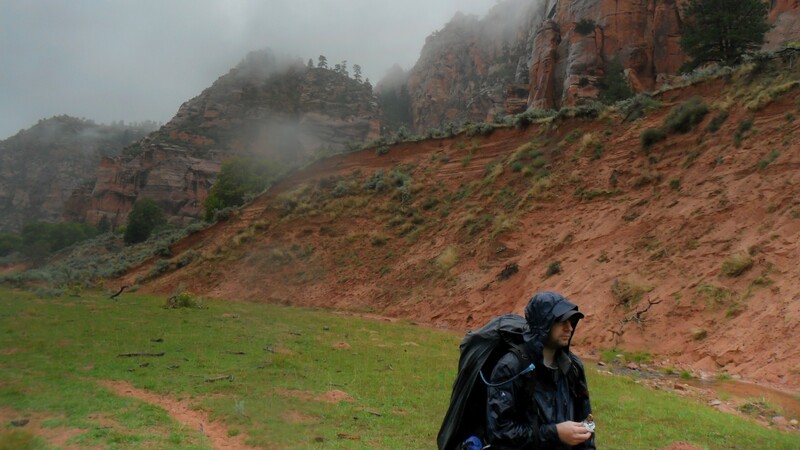 Top: The Marmot Oracle (also shown in the Zion picture) is a 2.5-layer jacket. At a distance the membrane doesn’t look significantly different from the 3-layer design below it (Arc’Teryx Alpha LT) but a closer look shows that the former has a smoother texture. 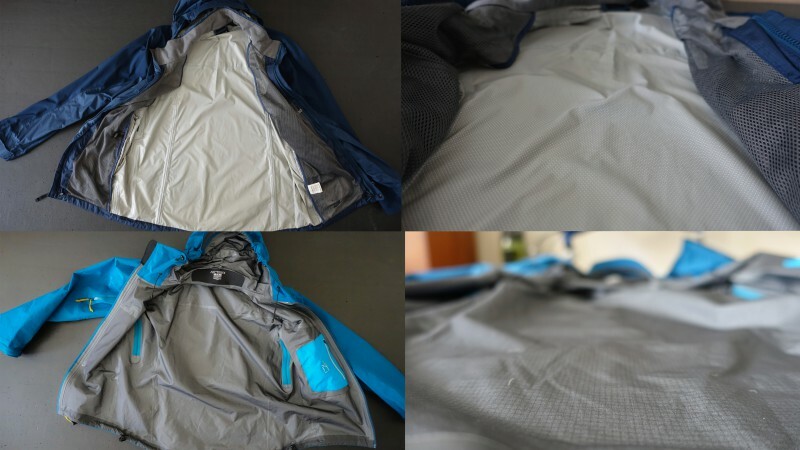 The appearance of the Oracle’s membrane is fairly standard for this type of 2.5 layer jacket. The final component of the four is DWR (Durable Water Repellent) which is a chemical treatment on the outer fabric. DWR is what causes water to bead up on the shell. Since the outside of the jacket isn’t waterproof, the shell material can become saturated (this is known as “wetting-out”). The problem with the shell wetting out isn’t that you’ll get wet from the rain (the membrane on the inside will keep that moisture out), it’s that the moisture on the inside (sweat) is unable to escape, or “breath”, through the saturated outer fabric. Depending on your exertion level and how much you sweat, this can result in becoming just as wet as if there was no membrane at all and the jacket simply soaked through. First and foremost, do not let marketing sell you a jacket. Complicated diagrams and FancyTerms™ do not necessarily translate into better results. In fact, it’s best to ignore the hang tags altogether. If you were to put the tag for a $150 jacket next to the tag for a $500 jacket and cover up the prices, it’s unlikely you would be able to guess which is which based solely on the description. They’re both going to tout their breathability and neither is going to concede any limitation that may be addressed by a different or more expensive product. If you’re in a retail store, pay attention to what the sales person is telling you. If they’re throwing around terms and phrases that sound like they came straight off of the hang tag, it’s best to take what they say with a grain of salt. That doesn’t mean ignore them completely, but keep in mind that even in a store like REI, it’s unusual to find somebody who actually has field experience with all of the products they sell. Most of what you’ll hear is a combination of anecdotal information based on the experiences they do have (which can be highly variable) supplemented by the marketing material they have for the rest of their products. Don’t be sold on experience alone either… having a lot of experience with a specific activity (backpacking, climbing, skiing, etc.) doesn’t guarantee experience with a wide range of products within that activity. Retail workers are like anybody else: they may have access to some perks but they’re still working on a limited budget. Unless they won the lottery or they’re independently wealthy, it’s highly unlikely that they’ve thoroughly tested more than a handful of variations for a specific product. Comparing rain pants: 3-layer (left) vs. 2.5 layer (right). Notice that the 2.5-layer is really just a pattern imprinted directly on the membrane whereas the 3-layer actually has a separate material covering the membrane altogether. 1) When asked a general question about rain gear (or any gear, really) they don’t immediately turn around and push 1-2 specific products, stating that they’re “far and away the best”. Instead, they’ll describe the features of each product and be able to translate what that actually means in a real-world scenario. All jackets are just different combinations of similar features. Staff should be able to separate these features from the brand / model of a certain jacket and generically describe why they are or are not important. 2) THEY LISTEN. And they ask questions. I once had a sales rep at a music store not only try to sell me a set of guitar pickups without ever asking what type of music I played, but when I asked him what he thought about a certain type of pickup (already knowing that they were probably what I was looking for), he said, “NAH MAN, You don’t want those. They’re only good for <insert music genre here>”. Of course, that happened to be exactly the genre of music for which I was looking to write songs at the time. He gave me recommendations for a product that would directly affect the sound of my guitar without ever finding out what I was looking to do with it. In the end, he sold a product by recommending against it. Unfortunately for him (and for that music shop), he didn’t actually get the sale. I left the store and bought the pickups somewhere else. This was not an isolated incident, either. I’ve lost count of how many times I’ve seen people recommend products without ever asking their customers what they intend to use them for. The very first question anybody in sales should ever ask is, “how do you intend to use this?”. Sadly, this is somehow an uncommon question. 3) They discuss the limitations of the product and not just it’s advantages. If the response to “What’s the difference is between these two rain jackets?” is ever: “Well, this one is great… and this one is even better“, run, do not walk, to the nearest exit. A person who knows what they’re talking about should understand that most advantages aren’t the result of magic, they come at the expense of something else. Finding out what these tradeoffs are is the key to making an informed decision. Much to the joy of gear companies (and much to the ire of some cynical gear junkies, I’m sure), I’ll touch on this. While marketing departments have pretty much had their way with consumers for years when it comes to the whole waterproof/breathable concept, there’s been an opposing trend in recent years that has gained traction: that since none of the waterproof/breathable fabrics work the miracles they’re purported to, all are equally bad. As much as I would love to jump on this particular bandwagon, my experience has indicated otherwise. Most recently, I’ve been switching between an OR Helium II (with a 2.5-layer Pertex membrane) and an Arc’Teryx Alpha LT (3-layer GoreTex Pro membrane), and have had significantly different comfort levels between the two. Some would say that it’s silly to compare a jacket that’s almost $600 to a $150 jacket… to which I would reply: “So you’re saying there IS a difference?” Let’s be clear: I think $600 for a rain jacket is ridiculous (I got mine on sale and I still think it was ridiculous) but there is something to be said for the premium membranes (the newer GoreTex Pro, eVent, NeoShell). They do seem to breathe better than some of the budget models (note that not all GoreTex is created equal either. There are different membranes within their product line. It’s important to know exactly what you’re getting). The membrane of a jacket makes a difference, but there are other variables that can affect your overall comfort level as well. Earlier I mentioned the differences between 2.5 and 3-layer jackets… so how does that actually translate to performance? 3-layer jackets are usually said to be more comfortable because the extra layer absorbs some of the internal moisture, whereas 2.5-layer jackets can feel clammy and excessively damp. I think the reason for this is twofold: first, since the membrane is actually the hardest material in the jacket for internal moisture (or moisture of any kind) to penetrate, it means that in a 2 or 2.5-layer design it’s more likely that any buildup of moisture inside the jacket will come into direct contact with your skin. I’ve experienced this with multiple jackets and generally find 3-layer versions to be more comfortable. The second reason is that a lot of manufacturers only use the premium membranes in a 3-layer construction, which means that a lot of the 2.5-layer jackets you’ll find simply aren’t going to breathe as well as the 3-layer versions (I don’t think this is universally true but it’s something to look out for). The material used for the outer shell can impact breathability as well, which is why companies like Arc’Teryx spend so much time and effort in this area. Making the shell fabric lighter tends to accommodate breathability, but it comes at the expense of durability. It’s important to consider what kind of terrain you plan on covering in your jacket… if you’re looking at wide open alpine spaces, durability isn’t as much of an issue. If you’re going to be spending most of your time hiking through dense forests and overgrown trails, durability becomes a bigger factor. Another thing to consider is how well a jacket vents. Venting is different than breathability in that it involves air and moisture escaping by way of a direct opening vs. working its way through the fabric. Venting can occur through any opening… the front zipper, pit zips, mesh pockets, etc. Umbrellas and ponchos reign supreme (pun intended) when it comes to venting but the tradeoff is the increased exposure to the elements. This may not be an issue in hot and humid climates where there’s little chance that a breathable jacket will be able to function anyway (keep in mind that the principle under which most breathable fabrics operate is that the humidity on the outside of the jacket is lower than on the inside), but this may be less desirable in cooler climates where protection from the elements is important to prevent hypothermia. I’ve read a lot of articles and discussions that suggest that venting is more important than the breathability of a fabric, but my personal experience is that the more you open up your jacket, the more the rain comes in. Pit zips work fine in gentle showers but I’ve found that in sustained downpours, they let in more moisture than they let out. The same goes for the theory that mesh pockets are better than solid pockets: some people say that having mesh allows you to open your pockets during a rainstorm for additional venting. In my experience this just allows more water in, which is why I prefer solid pockets. That way if I need to get into my pockets for any reason, the moisture I let in doesn’t go directly to my body. Comparing the OR Helium II (left) to the Marmot Oracle (right). Both are 2.5-layer jackets but the Oracle is over a pound whereas the Helium weighs in at just 6oz. The heavier face material certainly contributes to the extra weight on the Oracle, but there’s also extraneous fabric all over the jacket… flaps that cover the main zipper, pit zips, and pockets, 4 pockets, mesh all over the inside, fleece lining on the collar, etc. It works well enough for wearing around town but I’ve never had a good thing to say about it on the trail. In fairness to Marmot, I bought the Oracle 6 years earlier than the OR model, but there are still plenty of jackets out there with the same pitfalls. Venting comes at a weight penalty too: the more zippers and mesh you have, the heavier the jacket tends to be. This isn’t to say that things like pit zips don’t have their place. I still prefer to have them in situations where venting is possible after a heavier rain subsides but it’s still too cool to remove the jacket entirely. Speaking of weight penalties, it’s also a good idea to survey a jacket for unnecessary fabric. Laminated zippers have largely replaced the need for a front flap, and areas like the collar and hood will sometimes contain unnecessary niceties like fleece linings or extraneous adjustments. This tends to occur on cheaper-to-mid-range jackets that use a 2.5-layer construction but are burlier than they probably need to be. I think the 2.5-layer design works well for ultralight jackets that use the lightest fabrics and cut off all the extraneous components, but if you’re going to get a heavier jacket, the 3-layer design will probably be more comfortable (and durable). Rule #1 of waterproof/breathable outerwear: do not expect to stay completely dry. You will sweat and it won’t all escape before it starts to dampen your clothes. At the very least, consider that the sweat from your back has no place to go as long as you have a pack smashed up against it… no matter how breathable your jacket is. The best thing you can do is anticipate the fact that you’ll be damp during a rainstorm and figure out how to manage it. One of the most effective ways is to select your base layers carefully. This is an entire topic unto itself but the important thing to know is that thinner base layers will dry more quickly than thicker ones. Synthetic vs. wool doesn’t matter; thinner wool will usually dry more quickly than thicker polyester. I think the difference between a bad jacket and a good jacket isn’t that one will keep you completely dry, it’s that the latter will at least keep you comfortable if used properly. Which leads me to my last point: part of using a jacket properly means buying the right thing for the job. Spending a lot of money doesn’t guarantee success. Premium jackets work well in certain environments (cooler weather, lower general humidity) but they’re not suitable for every situation. This is probably the most important thing to keep in mind when shopping for a jacket. ← How Much Did You Say This Stuff Costs?